Recently, LovetoKnow had the pleasure of chatting about decorating with antiques with Betsy Knapp of Tigerlily's. Betsy is a multi-talented designer with the unique ability to use what is at hand. She isn't afraid of items that are often overlooked by others and recreates them into unique items that her customers love. Jenke's Farm is her 18th century farmhouse in Narragansett, Rhode Island. It is one of the oldest houses in town. This is the palette of her creative designs and ideas. Betsy loves the old feel of Rhode Island and considers it her favorite place to antique. Not surprisingly, these treasures often find their way into the shop, Tigerlily, and the antiques showroom, La Maisonette. La Maisonette is the underground showroom where the efforts of the design team have brought together an eclectic assortment of items. Original period landscapes, art deco furniture, and other treasures are plucked from the local estate sales, antique actions and antique dealers. This collection is rounded out by what Besty picks up in her travels overseas. LTK: Betsy, what is your favorite style of antiques? Betsy: I love the French antiques. I travel quite a bit in France. The Chinese Chippendales, the turn of the century camelback sofas, are all over my home. LTK: Where do you find the antiques that you use? Betsy: Oh, everywhere. Thrift shops and flea markets especially. People call me and let me know when they have found something or are selling something. I used to be a nurse in this area so I know many people. They call me with their finds or things they think will interest me. I also pick them up in my travels. LTK: What is your best advice to people who are planning on decorating with antiques? Betsy: Don't be afraid to experiment. People are cautious about antiques. Skeptical. They want whatever is "in" at the moment. They are afraid to refinish or recover antiques or use it in a new way. They shouldn't be. I like to use things in different ways. 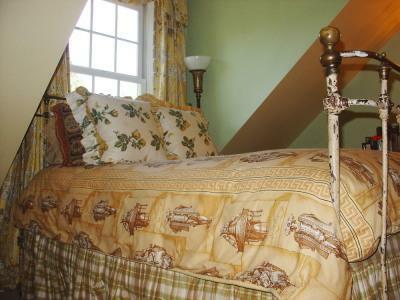 Antique linens and scarves can become pillows and valances. I have used old towels to upholster chairs. LTK: How have you used antiques in your décor? Betsy: I covered a flat screen TV. with a damaged, antique oil painting, just made a sleeve in it to cover the screen. Vintage headboards can be padded inside the moldings and have fabric attached. Old and cracked mirrors can be implemented into an unusual headboard. My husband and I have done that many times. Dressers can be faux painted and have whimsical fabrics added to them. Antique shutters make a great headboard for a little boy's room. When working with children's furniture you have to watch for the safety codes. Old items often are dangerous, so you turn them into something else. You can turn a vintage crib into a wonderful headboard or a daybed, for example. Old, mounted horns can be used as towel racks, or hanging racks in a boys bathroom or room. I like to use vintage egg baskets to hold toys and small items. Vintage trunks, of course, hold linens or toys. Children's rooms should not be baby-ish but should grow with them. Use fabrics and items that will not need to be changed often. Use what you find. I once did a shelf over a window and lined it with vintage bowling pins! LTK: Do you go to people's homes to come up with ideas or do they come to you? Betsy: Oh! They usually come to the shop. They will bring me a pattern of some sort and we will go from there. I believe in working with what you have, using what is already there. There is no need to replace everything. We have a 3000 square foot store, and a huge inventory of fabrics. We even have our own down and feather room! We can do most everything here. There are no surprises for our customers. We do everything by hand. The furniture is stripped by hand and then when we get down to the wood we will show them what they have before moving ahead. Details are important. Tigerlily and La Masionette are open Monday through Friday from 10 a.m. to 6 p.m. and on Saturday from 10 a.m. to 2 p.m.
You can also visit Betsy and her design team at Tigerlilys for more information.